A frequent migrant visitor to our shores which may appear anywhere there is standing water although does have a preference for larger ponds and lakes. Reported from over 20 sites in 2006 but 2017 has seen a large influx which, with luck, may increase on this. 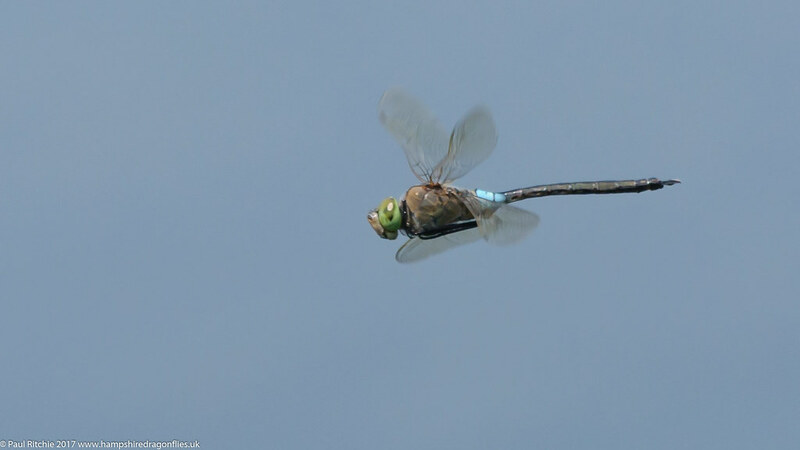 Similar to our own native Emperor Dragonfly but smaller and not as vibrant. There is a very noticeable, bright blue "saddle" at S2 which is recognisable in flight. The rest of the abdomen and the thorax is brown while the eyes are bright green. When seen side by side with our 'Blue' Emperor the differences are unmistakleable, and this can happen frequently where there is a dispute over territory. The females (usually) oviposit in tandem with the male - which is another diagnostic - although I've yet to be lucky enough to witness this.